This lesson on Jazz Bass Soloing takes a look at how a bass player may choose to solo on a Major ii V I progression. This progression can be heard on Backing Track One. The Major ii V I progression is the bedrock on which jazz is formed. It can be heard in almost every tune from the late swing period onwards. It is important to know that in jazz, the iim7 chord was a slightly later addition and found more popularity during the bebop period. In the majority of the swing era, this chord progression originally just“V to I”. The ii chord was added by bebop players to provide additional soloing options without affecting the tonality of the progression. Do not rush the following steps as the work you do now will help build a deep understanding and musical feel for the most commonly played chord changes in music. Begin by learning the chord progression and root notes. Memorise these note positions as they should form visual ‘anchors’ for everything that follows in this lesson. 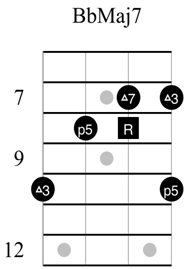 The following arpeggios are the ones that you need to know to solo over each chord in turn. Notice that they are built around the previous root notes. Try to visualise each root note as you play up and down each arpeggio. Use the following steps to help you memorise each arpeggio shape. 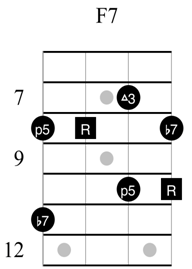 Before each step, play the chord associated with each arpeggio (shown in black). Play the arpeggio ascending from the root. The root is shown by the black square dot. Play the arpeggio ascending from the lowest note on the sixth (bass) string. Play the arpeggio descending from the highest note on the first (top) string. Ascend and descend the arpeggio from the lowest note to the highest. Repeat the previous step, but this time say the name of each interval out loud as you play it. 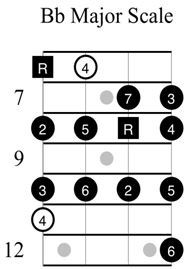 For example, for the Cm7 arpeggio above, say, “Root, flat three, five, flat seven”. When you can comfortably play these arpeggios, try linking all three arpeggios together using the following steps (you do not need to have memorised each shape yet, it is O.K. to read them from the paper). Ascend each arpeggio in turn from the root. Take a short break between each arpeggio. Ascend each arpeggio in turn from the lowest note on the sixth string. Descend each arpeggio in turn from the highest note on the first string. Ascend the first arpeggio from the lowest note, descend the second from the highest note and then ascend the third from the lowest note. Be creative with your exercises and find new ways to memorise these arpeggio shapes. Even writing the arpeggios out from memory can be very beneficial if you don’t have a bass to hand. When you are feeling confident, it is time to begin the playing some exercises to target chord changes. The first task is to focus on a tiny part of the bass and find as many ways to change between the arpeggios as possible. Using Backing Track One, begin by isolating the top two strings of the bass and play four notes from each arpeggio in each bar (1/4 notes). In the previous example, the chord sequence is repeated twice, and on each repetition I have shown a different way to navigate the changes. The only rule is that I hit a tone from the new arpeggio each time the chord changes. The examples in this lessonare only a starting point. Your task is to find as many ways as you can to navigate between each successive arpeggio. Staying on these two strings, let your fingers go for a walk around the arpeggio shapes and see how many routes you can find to ‘hit the changes’. When you begin to run out of ideas, switch to the next two-string group, i.e., the second and third strings, and repeat the exercise. Here are two possible routes through the changes. Repeat this process on the final two-string group. It should be clear by now that some notes are common to more than one arpeggio. If you wish to repeat a note on a chord change, this is acceptable just so long as the note exists within both arpeggios. Gradually, you can start focusing on slightly larger string groupings. 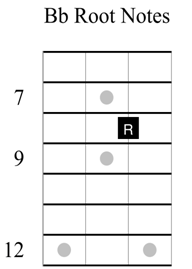 The following example shows the same exercise played across the lowest three strings. Find as many ways as you can to navigate the changes using just this three-string group. Work through every possible adjacent three-string group and then progress to four-string groups. You will quickly build up a wide variety of ways to link each arpeggio together. All the work you do here will pay huge dividends in the future. As you get better, start doubling up some of the rhythms by adding some 1/8th notes. A great way to begin is to add 1/8th notes on just the final beat of each bar. Repeat this exercise but try varying the beat on which you place the 1/8th notes. Gradually introduce more 1/8th notes to each bar until every single note is an 1/8th. The next stage in the process is to play a non-arpeggio note on beat four of each bar. There are three ways to do this. With chromatic passing notes: A chromatic passing note fills in a one-tone gap between arpeggio notes in different chords. 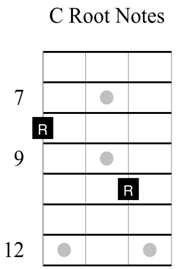 With scale tones: A scale tone can also be used to fill in a gap, but the scale tone will always come from the chord’s parent scale. 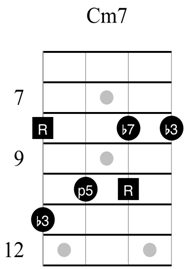 In this lesson, the parent scale is Bb Major. With chromatic approach notes. These are just like chromatic passing notes, but they can be played either side of the target tone. These three techniques are the most commonly used decorations in jazz music and they are always used to smooth out the transition between notes in different arpeggios. This is easier to see and hear musically. Study the following example carefully. Pay attention to the first five notes. On beat four of the first bar, I have added a chromatic passing note to fill in the gap between the Cm7 and F7 arpeggios. Even though this note has nothing to do with either arpeggio, it bridges the gap between the notes in the arpeggios. The sequence of notes beginning on beat three is G, G#, A; and forms a chromatically rising melody. 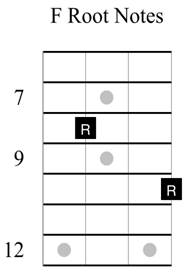 The same technique is used at the end of bar two, where I join the b7 of the F7 arpeggio (Eb) to the 5th of the BbMaj7 arpeggio (D). The sequence of notes is Eb, E, F.
This idea is repeated in bar four, where I link the 5th of the BbMaj7 chord (F) to the 5th of the Cm7 chord (G) using the chromatic note ‘F#’. Whenever there is a one-tone distance across a chord change, it can be filled with a chromatic passing note in this way. I used a scale tone because the distance between the changing arpeggio notes was greater than a tone and the scale tone was the smoothest way to link the two notes. Finally, between bar five and bar six I used a chromatic approach note.I used a chromatic approach note because the last note of the F7 chord (Eb) and the first note of the Bb chord (D) wereonly a semitone apart and, therefore, there is no gap that I can fill chromatically. I needed to play something on beat four to lead into the BbMaj chord so I ‘leapfrogged’ the target note (D) and played a note one semitone below the target note (C#). This meant that I could surround my target note by a semitone on each side. This is a very common technique and the three notes together (Eb, C# and D) form an important melodic structure called an enclosure. Think of an enclosure as a sandwich with the target note as the filling. The following example shows another route around the changes and makes use of all three techniques described above. Each technique is marked on the music. Analyse the previous example to make sure that you understand how the different techniques function. Reread from the ‘Joining the Dots’ heading if you are unsure of anything. The most important concept to work on is the chromatic passing note pattern. This is when you fill in a one-tone ‘hole’ between arpeggios. Begin by adding a chromatic passing note on beat four of the bar because this will add to the strength of the melodic line when targeting the arpeggio note in the next chord. If no chromatic passing note is available, then try ‘sandwiching’ the target note with a chromatic enclosure (approach note) or targeting it via a scale step using the Bb Major Scale. Begin with simple, two-string groupings and explore as many ways as you can to join the dots using a chromatic passing note on beat four. As you gain confidence and vision, gradually start using three-stringand four-string groupings. Finally, begin to introduce 1/8th notes just as you did in example 1d. The following example shows just one way to add 1/8th notes to beat four of each bar. Work through example 1g and make sure you understand how I have navigated from one chord tone to the next on each change. Remember, there are hundreds of different ways to play through these changes. It’s up to you to put in the time to find as many routes as possible. Gradually add in more beats of 1/8th notes as you progress. When you practice these ideas, start off very slowly without using a metronome or backing track. As you become familiar with your territory, introduce the backing track and ensure you always hit a correct arpeggio tone on beat one of each bar. Don’t worry about mistakes, they will always happen at first, and they help you to learn more quickly. The real goal is to forget about constant lines and patterns and to gradually leave space in your playing. The idea is to play shorter phrases that run across the bar line. You will find that your playing immediately sounds a lot jazzier. Here is one idea that uses all the melodic concepts covered in this lesson. This previous line is constructed completely from chord tones and chromatic approach notes. The only thing that has changed is the rhythm.